Featuring high quality products from Industries and other top flight Manufacturers. About Us - Central Irrigation was founded in 2001, and is a division of Victoria Construction Corporation in South Florida. Our commitment has been to our valued customers in providing the highest quality of professional service and technical assistance. We specialize in meeting the needs of the people we serve. Our knowledge and experience has earned us a respectable reputation throughout South Florida. 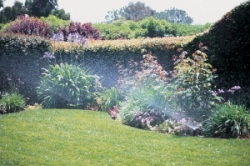 As an Irrigation Contractor, we can provide you with excellent service. We do this with promptness, accuracy, and courtesy. Our pride is quality workmanship and honesty. The majority of our referrals come from satisfied customers. We truly thank them for their confidence in us throughout the years. We would like to Thank You for taking the time in learning more about us. We understand that your time is very valuable and precious. Give us the opportunity to provide you with outstanding business and your satisfaction will be guaranteed. Sprinkler Systems - From gardens to golf courses, from custom homes to campuses, from shopping centers to sports fields…Central Irrigation is an expert at the design & installation of underground irrigation systems. A sprinkler system is a huge asset for any home or commercial property, as it will automatically keep lawns, shrubs & other landscaping properly watered, saving thousands of dollars over the lifetime of a property by avoiding lawn & plant replacements and by providing regular watering regardless of rain or dry conditions. 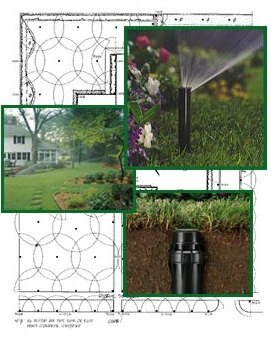 Central Irrigation will design & install a complete irrigation system for your property. Our experts are knowledgeable of the right types of sprinkler heads for small or large areas. Using computer drawing and state of the art software like RAIN-CAD We will design a system with valves, back-flow, piping, fittings, rain-sensor and digital controller (timer) to ensure high performance and efficiency. INSTALLING AN AUTOMATIC SPRINKLER SYSTEM IS A COMPLEX PROJECT: Central Irrigation is a qualified contractor and experts in: System Design Hydraulics, Proper sprinkler system layout, Plant water requirements and soil types, Local electrical, Plumbing, and back-flow prevention codes, Proper sprinkler system installation procedures. A carefully designed system incorporating: System design capacity (Maximum flow and pressure), code-required backflow prevention device, manufacturer recommended sprinkler valve and pipe size layout. A sprinkler system incorporating effective and efficient operation including: Head-to-Head coverage 100%, Matched precipitation nozzles, Separate zones for spray and rotors heads, Optimum operating pressure, Recommendations to suit your soil and plant type. Instructions on operating of: Your automatic controller, adjusting your sprinkler and operating system "run times" to suit seasonal changes. Excellent warranty: Included with your installation is a Two-Year limited warranty provided by Central Irrigation. We are available for our customers 24/7. You don't believe? Just give us a call. We are dedicated to serve you. BASIC IRRIGATION SYSTEMS INCLUDE: Rotary heads for all lawn area, separate zones of pop-up or sprays heads for landscape areas, drip system when required, appropriate back-flow prevention approved by your town or village, rain sensor, control valves; minimum valve size 1", pvc pipe 1" as the system requires, and an easily operated digital control timer. A Water-efficient sprinkler system, proper installed using high quality professional equipment is a great investment. It will provide years of trouble free operation, adding value to your property and maximizing the beauty of your landscape. 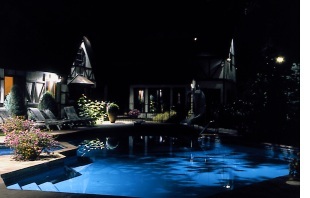 Nightlife commercial and residential-grade lighting fixtures compliment any landscape design with the broadest selection of styles, finishes and lamping options. Nightlife landscape lighting fixtures, like the HADCO name, have become synonymous with superior quality, innovative optical technology and optimum performance. Great care is taking in manufacturing and installation from the selection of raw materials and component to the hand-rubbed oil and verde finishes. Precise engineering, backed by ISO 9001 Certification, ensures that the assembly of each product has been painstakingly checked for consistency and reliability. HADCO exceeds industry standards by offering a comprehensive Three-year limited warranty on all components for complete owner satisfaction. 120 VOLT/HID PRODUCTS: For projects requiring optimal performance Hadco's 120 V outdoor fixtures provide maximum light output and installation flexibility. The 120 V system is designated to operate utilizing either incandescent, fluorescent or H.I.D. lamping options. Because of theis size and flexibility, 120 V systems are ideals for large-scale landscape projects, and a line voltage installation means there can be unlimited distance from the power source to the fixture. The inherent design of HID fixtures have greater life span and lighting intensity, making the product ideal for permanent commercial or large residential installation. 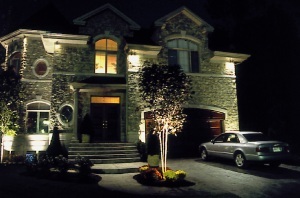 LOW VOLTAGE PRODUCTS: Hadco's Low Voltage lighting system offer the greatest versatility with up to 1,000 fixture combination for every landscape lighting application. High performance halogen lamps, available on many stiles, produce greater lumen output and last longer than conventional incandescent lamping. All Hadco low voltage transformers include a triple-tap voltage setting that allows for easy adjustment of load and distance variations. Fixture housings are constructed of the most durable materials that include die cast aluminum, composite, stainless steel, cast bronze and die cast brass. All painted finishes are applied through a special five coat powder process to retain their beautiful appearance for many years. HIGH PERFORMANCE: Use of cut-off and light-shielding design provide outstanding visual effects without objectionable glare. 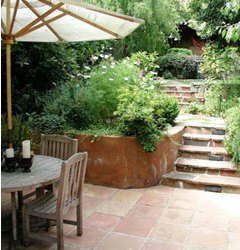 WIDEST SELECTION OF STYLES: Complete line of path, accent,deck,inground and underwater fixtures in natural or durable finishes. LOW MAINTENANCE: Corrosion-proof fasteners simplify relamping, and watertight construction protects optics for long life. BEST INDUSTRY WARRANTY: Warranties up to the life of the product of fixtures and accessories along with UL and cUL listing for safe and reliable operation.